Digital oximeters are a great non-invasive solution for anyone needing to measure oxygen saturation in their blood on a regular basis and helps avoid the hassle of taking frequent blood samples. A digital finger Pulse Oximeter is easy to use and fits comfortably on the tip of your finger, relaying your results in a matter of seconds. The Elite digital oximeter features a high resolution, easy-to-read OLED display that most models don't carry and adjustable brightness for day and night. It also boasts approximately 30 hours of operation for each battery charge (two AA alkaline or rechargeable batteries) and an automatic power-off feature to save power. 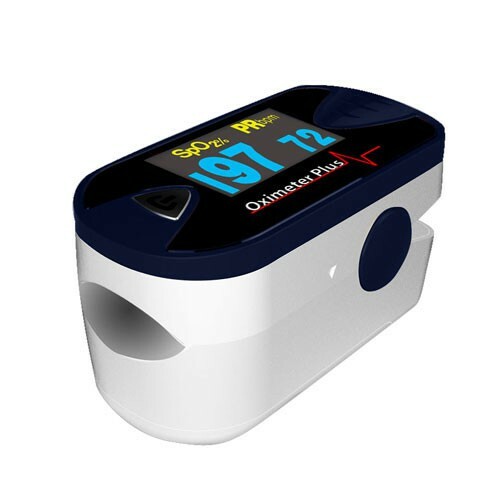 See below for specifications on The Elite digital pulse oximeter and be sure to check out other Oxi-Go digital finger pulse oximeters such as The Premier Pulse Oximeter, the QuickCheck Pulse Oximeter, and the QuickCheck Pro Pulse Oximeter. Also see our handheld digital oximeters such as the 300i Pulse Oximeter and the 300K1 Pulse Oximeter. The doctor said we have to monitor Dad's oxygen saturation. I didn't bother checking with other people what's the best oximeter because his doctor highly recommended this one. He showed us the two kinds of oximeter at the hospital, the other one is this brand, the other one a less known one. We did the test and checked if this one by Oxi-Go will work well and it did. Both brand measured the same, the other one he said is more expensive and since the Oxi-Gow works the same, at a more affordable price then we bought this! It never failed us!